The global thalassemia treatment market is driven by increase in number of altered thalassemia genes across the globe. The global market was valued at US$ 842.0 Mn in 2017 and is projected to expand at a CAGR of 7.9% from 2018 to 2026 to reach US$ 1,639.6 Mn by 2026. The global market is witnessing high growth owing to increase in blood transfusion and chelation therapy treatments, high number of bone marrow transplants, increase in number of spleen surgeries, and surge in R&D expenditure. Thalassemia is a genetic blood disorder which produces abnormal hemoglobin in the body. This genetic blood disorder leads to the formation of a large number of red blood cells that are continuously destroyed, which further leads to anemia. The two types of proteins present in the blood of thalassemia patients are alpha globin and beta globin. Alpha thalassemia occurs primarily in people living in Southeast Asia, the Middle East, China, and Africa. Beta thalassemia occurs in people in the Mediterranean origin, and to a lesser extent in people in China, other Asians, and African Americans. Chelation therapy and blood transfusion are the most common treatments for thalassemia patients, as these are cost effective and are easily available compared to bone marrow transplantation. Chelation therapy uses drugs such as deferasirox for the treatment of chronic iron overload occurs during multiple blood transfusions among non-transfusion-dependent thalassemia patients. Chelation therapy drugs used subcutaneous or intravenous with slow infusion technique for purifying blood increase the possibility of curing thalassemia patients. Blood transfusion helps patients suffering from alpha thalassemia or beta thalassemia. The transfusion treatment procedure improves overall operational efficiency. High prevalence and incidence rates of thalassemia and rise in number of stem cell transplantations among the global population have resulted in increase in patient flow to private clinics and hospitals. These factors are projected to drive demand for blood transfusion procedure for thalassemia treatment in the near future. Moreover, advancements in gene therapy such as gene editing, stem cell therapy, and proliferation of new drugs for thalassemia treatment are anticipated to fuel the growth of the global thalassemia treatment market from 2018 to 2026. The global thalassemia treatment market has been segmented based on treatment type and region. In terms of treatment type, the global market has been categorized into blood transfusion, chelating therapy, bone marrow transplant, and others. The chelation therapy segment accounted for major share of the global market in terms of revenue in 2017. The segment is projected to expand at an exponential growth rate during the forecast period. Blood transfusion offers several advantages over bone marrow transplantation such as low cost of treatment. Hence, blood transfusion is gaining popularity among thalassemia patients. Geographically, the global thalassemia treatment market has been segmented into North America, Europe, Asia Pacific, Latin America, and Middle East & Africa. North America is projected to lose market share between 2018 and 2026. The market in North America is primarily driven by rapidly increasing immigrant population from tropical regions, growing number of population with thalassemia carrier gene, and rise in birth rates due to variation of genes among the population in the U.S. Moreover, increase in same community marriage practices and high birth rate of alpha thalassemia patients have been observed in Asia Pacific. This is projected to increase adoption of blood transfusion and chelation therapy treatments during the forecast period. Middle East & Africa is projected to be the fastest growing market for thalassemia treatment during the forecast period. 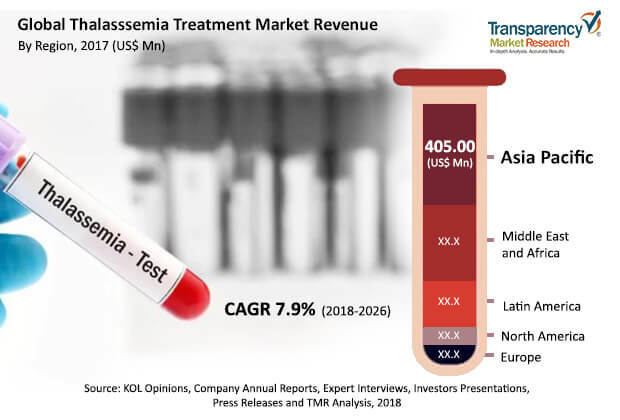 Rest of Middle East & Africa dominated the thalassemia treatment market in the region, while the market in GCC Countries is estimated to expand at an exponential CAGR during the forecast period. Companies such as bluebird bio, Inc., Acceleron Pharma, Inc., Novartis AG, Celgene Corporation, and Shire plc (Takeda Pharmaceuticals) accounted for the major share of the global thalassemia treatment market in 2016. Celgene Corporation has provided over 525,000 patients with the prescribed Luspatercept medicine. In 2017, the company accelerated 160 trials in approximately 60 indications and more than 25 new molecules have entered preclinical or phase 1 development. Other global players operating in the market include Incyte Corporation, Kiadis Pharma, Gamida Cell, and Bellicum Pharmaceuticals. Companies are adopting the strategy of acquisition and collaboration with parallel companies to improve and strengthen geographic presence in the international market. Moreover, the partnership agreement with companies is expected to increase in number of clinical trials for thalassemia in the near future.